Star Wars: Skellig Michael preparing to feel 'the Force'? 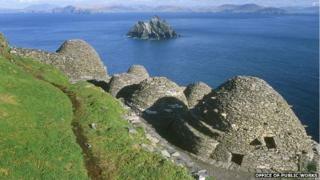 Image caption Is Skellig Michael, off the coast of County Kerry, about to be a location in the latest Star Wars movie? It's lightsabers at the ready in County Kerry as one the biggest movie franchises in the galaxy may be preparing to roll into town. The picturesque island of Skellig Michael is believed to be about to be used as a location in filming for the much anticipated seventh Star Wars film in late July. Filming has already taken place at Pinewood Studios in London and in Abu Dhabi. If filming does take place at Skellig Michael, it will be the first time that the Star Wars universe has landed in the Republic of Ireland. Skellig Michael is the larger of two islands in the Atlantic Ocean, off the coast of the Iveragh peninsula. A Christian monastery was established on the island at some point between the 6th and 8th centuries and was continuously occupied until the late 12th century. The remains of the monastery and most of the island were designated as a UNESCO World Heritage Site in 1996. Sites used for filming in previous Star Wars movies, such as the southern Tunisian desert, which doubled as Luke Skywalker's home planet of Tatooine, have become tourist attractions for fans of the films. Image caption Harrison Ford, Carrie Fisher and Mark Hamill starred in the original trilogy. But will they be in County Kerry? Star Wars: Episode VII will be the first in a new trilogy of films and will star members of the original trilogy, such as Harrison Ford, Carrie Fisher and Mark Hamill alongside relative unknowns. In June, Harrison Ford broke his ankle while filming in London. Full details of the filming are still unclear but the Republic of Ireland's Office of Public Works, which has responsibility for the island, has confirmed that a film production shoot is taking place later this month. "The Office of Public Works will be providing onsite support through our staff who are present on the island throughout the summer, as normal," read the statement. "They will be continuing to manage visitors throughout and will, obviously, continue to safeguard the national monument and the island, which is a World Heritage Site. "This production is being fully supported by the Department of Arts Heritage and the Gaeltacht and the Irish Film Board."